The World Economic Forum (WEF) is an entity that gathers together leading politicians and businessmen with the aim of contributing to global economic development. It is recognized by its ability to call upon leaders from all around the world to its annual forum organized in the city of Davos. Among its permanent actions is the construction and updating of the Global Competitiveness Index. It is an indicator of competitiveness of almost all the countries. One of the dimensions with which the WEF measures the competitiveness of the countries is the quality of their institutions. That is, the rules under which individuals, businesses and government interact to organize the production and, fundamentally, to define the ways in which the community will distribute the costs and benefits of development strategies. It is understood that if these rules reward the efficiency and equity of efforts, there will be greater conditions for prosperity in that society. How common is the diversion of public funds in your country (1 very much, 7 never), in Argentina the score was 1.7 while in Chile 5.0 and Uruguay 5.2. How common is favoritism in the decisions of the State in your country (1 very much, 7 never), in Argentina the score was 1.7 while in Chile 4.0 and Uruguay 3.9. How is the ethical behavior of the companies in your country (1 very bad – 7 excellent), in Argentina the score was 3.0 while in Chile 5.0 and Uruguay 4.9. 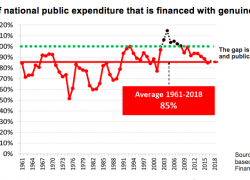 These data show that, in the perception of the very same entrepreneurs, in Argentina was much more frequent than in other countries the diversion of public funds in order to obtain special treatment by government officials. It is striking that in the self-assessment of their own ethics, Argentine businessmen placed themselves above government officials, but far below the self-assessment of their ethics by entrepreneurs in Chile and Uruguay. This is a very strong indication that the collusion between politicians and businessmen in Argentina during the Kirchners administration was installed, accepted and taken as natural. Furthermore, in the ranking of the WEF –in what refers to diversion of public funds and favoritism– Argentina ranked 143rd out of a total of 144 countries. In terms of business ethics, the self-assessment of businessmen ranked Argentina 138th out of a total of 144 countries. In these three dimensions, Chile and Uruguay are ranked between 20 and 30 of the 144 countries. In other words, in the vision of entrepreneurs, Argentina had reached levels of corruption and connivance only comparable to the worst African countries. That the trigger of the investigation on the political-business corruption is a casual fact (a personal Diary of a witness that fell at the hands of a journalist) and an avalanche of implicated businessmen now repentant, are mere anecdotes. The most serious and worrying issue is that a bizarre fact was necessary for society to become aware of the level of values deterioration, when there were clear and strong signs for a long time pointing to the corrupt forms of relationship between businessmen and the government officials. It is not possible for a country to progress without institutions that reward efficiency and ensure equity in the distribution of welfare efforts and benefits. For this, well-intentioned politicians and businessmen and heroic judges and prosecutors are not needed. International best practices indicate that what is needed are rationality in the rules of the game, culture of compliance with those rules, transparency of government acts and a judicial system that, far from bombastic, is effective, timely and efficient.